Our recent photo shoot took us to the area near Cusco, where we fell in love with the stunning architecture, the gorgeous landscapes, the vibrant culture, and most of all, the warmth and spirit of the Peruvian people and their colorful heritage. A land of contrasts, Peru’s mountain climate can be as harsh and unforgiving as its people are warm and cariñoso, (a difficult to translate Spanish word that can perhaps be best defined as affectionate). Perched at a (quite literally) breathtaking 11,000-plus feet above sea level, the Cusco region is home to both scorching sun and biting cold, and locals use a centuries-old technique to create frazadas, or thick blankets, to shelter them from the chilly mountain air. Our collection features vintage frazadas, also called mantas, that range from 30-40 years old. Each tells a story woven in colorful yarn, entwined with patterns and symbols defining the heritage of the weaver. While other mountainous regions of Central and South America produce textiles with some similarities, certain characteristics are distinctive to geographical regions. The designs featured by Sundance are unique to the area surrounding Cusco and to the creativity and imagination of the artists who created them. Extraordinary in their intricacy, one textile may take weeks or even months to complete, and many hands were involved in creating it. Step by step, the process is done by hand—shearing the sheep; dyeing the wool using a natural plant dye; spinning the yarn; and finally weaving the fabric. Each frazada is created by handweaving two textiles on floor looms, then joining them down the middle with decorative stitching. Traditionally given as gifts for weddings or other special occasions, being the recipient of a frazada is a moment to remember. Tireless in our search for the finest craftsmanship, we are proud to share with you the most exquisite vintage frazadas we could find. These heirloom-quality textiles are gloriously versatile—as a throw blanket in the living room, spread across a bed, or used for a picnic—and are meant to be used and enjoyed for generations. Perfectly gorgeous in their imperfections, the distinctly handmade nature of each frazada in our collection makes it unique from any other. Enjoy! 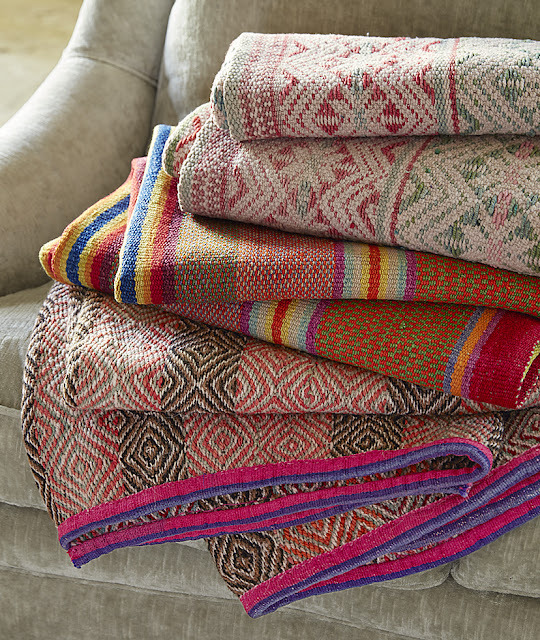 Shop our collection of Peruvian throws and other one-of-a-kind pieces here.